Gmail's contact manger started to include information from Google Profiles. You can also find your Google+ circles in the sidebar, below the list of groups. By default, the data obtained from Google Profiles is displayed below the information you've entered, but you can combine them: go to a contact page, click the "More" dropdown and select "[Show external data] inline". It's interesting to notice that the Google Profiles data is automatically added when you enter an email address associated with a profile. To remove this information, just delete the corresponding email address. The latest features are also available at google.com/contacts, which has recently switched to the new Google Contacts interface, but you can find them in the old Gmail interface, as well. This functionality is not available yet for Google APPS! The only thing I can't find is, how to put a specific contact in a group. I e.g. made a googlegroups group in the contacts, for adding adresses of googlegroups like accessible@googlegroups.com in; but how to get that adress in the googlegroups group? There are no checkboxes or something like that, in the dropdown menu you can't select add to group, like you can add a label in gmail to a conversation. Select a contact, click the Groups dropdown at the top of the page (the third button from the right/left) and you'll be able to select one or more groups. The interface is similar to Gmail's "add a label". If you're on a contact page, click the same dropdown. Another option is to click a group's name in the sidebar, click "Add to [group's name]" at the top of the page and start typing the email addresses of the contacts you want to add to the group, separated by commas. Well, it doesn't seem to work for Google Apps users. But even my google.com/contacts pages seems older than my GMail contacts page. I guess I'll have to be patient once again. What I'd really like to do is merge the two. I spent a lot of time years ago creating my own "circles" with my contacts, only to partially redo them when G+ came along. You can copy people from your circles into your contact groups, but not the other way around. i think this should be an opt-in feature, not too keen on it.. I really must be behind as I didn't notice this until I got my new GS3, that is where I noticed it anyway. @Josh, my thoughts exactly. But now they now allow you to add contacts to circles from the contact sidebar that appears when you open an email from them, so I suppose it might be done for the main contacts interface too. Still, I'd rather have the concepts merge, since you'd have to keep them in sync manually. Another thing: They didn't convert the whole interface yet: in google.com/contacts, if you try to add/change someone's image, the dialog is still styled as before, only with the huge white padding common to the G+ redesign. Makes total sense to me. Good marriage between the two services. One of many to come no doubt. I have the same problem. Anyway, it seems the whole process of integration is still in its beginning phase, I mean this new contact interface seems quite much an unfinished work, at least to me. This only thing I need is that my Google contact groups and Circles become exactly the same thing. Because I'm not going to waste my time building my "circles" again. Until that happens, G+ is a no go for me. It seems that I cannot name Gmail email contact groups the same thing as Google+ Circles. Yet, I cannot (in Gmail contacts) add contacts into Google+. Anybody see what I mean? Basically Google has made it so that I cannot use the same organizing structure in both Gmail and Circles. It's about time they did that. They are starting to link all the special services from one to another which makes it so much powerful. It's a nice move by Google. gmail contacts, of which a subset are in more than 50 contact groups. circles could show up to be selected like other groups. Fully merge groups and circles. I do not have G+, but I do have Gmail. A friend of mine (whom we'll call "Frodo Baggins") has a G+ account under the name of "Ron Weasley." He is listed under my contacts in Gmail as "Frodo Baggins." Because the email address I use to send email to him is the same one that he used for his G+ account, Gmail will not auto-complete when I type "Frodo Baggins" anymore. It complains that the name won't resolve and tells me to go check the address. Google linked his G+ account to his entry in my Gmail contacts list. So now when I want to send him email I have to send it to "Ron Weasley." I would like to have this functionnality as optional. I want to print a simple family agenda without all the fancy sites and extended info everyone adds but with this new functionnality I just can't... Is it possible? It seems g+ wants me to add my 500+ gmail contacts one by one. I don't think I'll do it. The problem is that people do not always update their Google+ profiles. When I manually enter their new numbers in google contacts, they revert back to the old Google+ information. I have lost few phone numbers this way! The issue I have is that it changes the name of my contacts - so, for example, instead of "John Doe" it defaults to their chosen Google+ username eg: "Super John" but how am I supposed to know that? It's irritating when trying to write an email to someone. 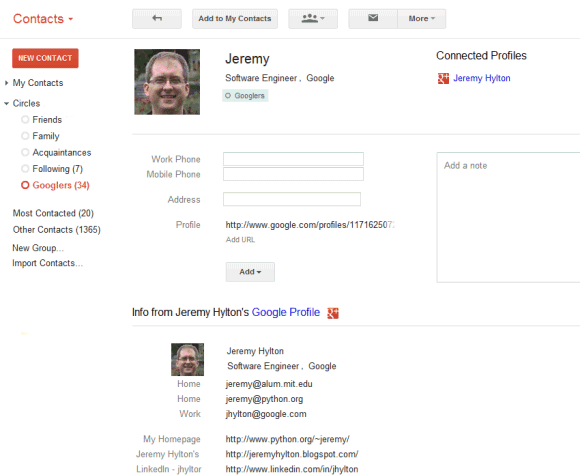 When adding a contact, their google plus profile is displayed and can be part of my contacts. That's great. But when I export to outlook excel, I do not see the address in their google plus profile. Is their any way I can merge their google plus profile to my contacts so I can export to an excel spread sheet?